When they're not hanging upside down, stick insects don't need to stick. In fact, when moving upright, sticking would be a hindrance: so much extra effort required to 'unstick' again with every step. Latest research from Cambridge's Department of Zoology shows that stick insects have specialised pads on their legs designed to produce large amounts of friction with very little pressure. 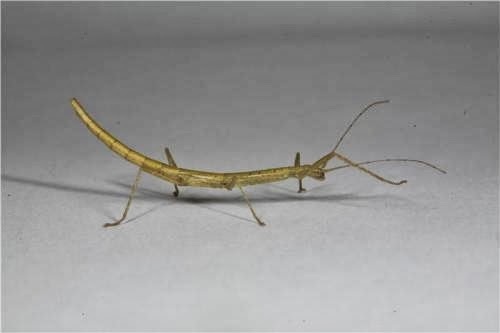 When upright, stick insects aren't sticking at all, but harnessing powerful friction to ensure they grip firmly without the need to unglue themselves from the ground when they move. In a previous study last year, the team discovered that stick insects have two distinct types of 'attachment footpads' - the adhesive 'toe pads' at the end of the legs, which are sticky, and the 'heel pads', which are not sticky at all. The insect uses different pads depending on direction and terrain. By studying the 'heel pads' in more detail, researchers discovered the insects have developed a way to generate massive friction when walking upright. They do this through a system of tiny hairs that use combinations of height and curvature to create a 'hierarchy' of grip, with the slightest pressure generating very strong friction - allowing stick insects to grip but not stick.